Oh man, am I ever sick of zombie games. So it was with great apprehension that I sat down for my first game of Hit Z Road. I was probably only talked into it because it's from designer Martin Wallace, one of my favorites. 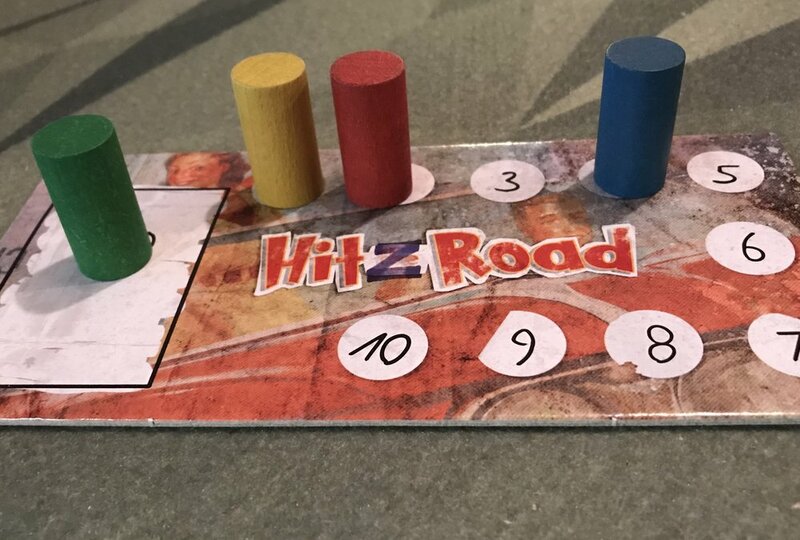 Hit Z Road is a lightweight dice-rolling, press-your-luck, auction game where you're trying to fight off hordes of zombies and survive until the end. 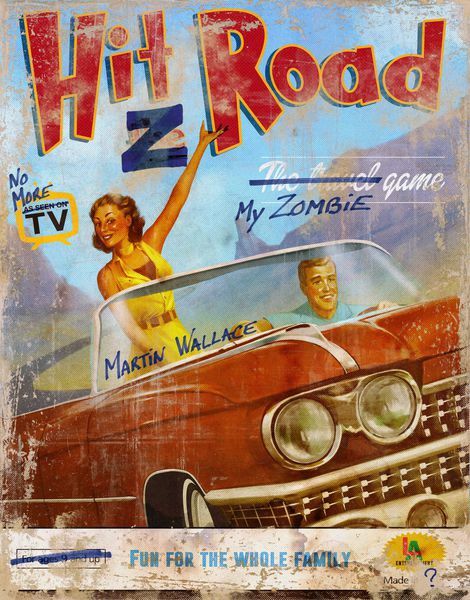 Is Hit Z Road a road trip worth taking, or will it just end up eating your face off? Let's find out! Each player takes a Lead Survivor and Bidding token in his or her color. Each player then takes 4 generic Survivors, and 4 each of the Ammo, Gas, and Adrenaline tokens. Then randomly distribute the Initiative tiles. Set out the Auction board where everyone can reach it, and have each player place their Bidding token on the zero space. Take each of the three levels of Adventure cards, shuffle each, randomly remove 4 cards facedown out of the game, and then create a deck with the 3s on the bottom, then 2s, and 1s on top. Hit Z Road is played over 8 rounds, each of which has the same three phases: Planning, Auction, and Encounter. Planning--Whichever player has the #1 Initiative tile draws the top 8 cards of the Adventure deck and randomly lays them out in four rows of two cards. Each of those two cards represents a Path. Then the auction begins--players are bidding for the right to choose which Path to take. There's no mystery on the Paths; you see exactly what's on the Adventure cards as you're bidding. Auction--Starting with Initiative #1, each player places his Bidding token on an empty number on the Auction board--though the zero space can hold any number of Bidding tokens. If a player's token is already on the board when it comes to his turn, he can choose to move it, but only to a higher bid. A player can also pass when it gets back around to him. Once every player has passed, the auction is over. Redistribute Initiative tiles based on how much people bid. (Players on the zero space keep their relative positions.) Finally, everyone pays what he or she bid, using the Resource tokens. You can use any combination of your tokens you'd like but you must pay the full amount you bid, and you can't bid more than you currently have. Then set each Bidding token on the zero space of the board. Encounter--Starting with the player who now has Initiative #1, each player chooses one of the 2-card Paths and moves through it, resolving the left card fully and then the right card. Each card potentially contains opportunities to Scavenge, have an Event, or Fight. Every card has at least one of those things. Some have all. Each card is different. If it's on the card, you'll Scavenge first, which means you get certain Resources. Then if there's an Event, you'll resolve that immediately--unless the text is red on a white background, in which case that rule will affect the fight you're about to have. Finally, you might have to Fight. If there's a zombie hand it'll show a number, and that's how many you Fight. Grab that many Zombie meeples and place them in front of you to track the fight. Then grab a black die for each Survivor you still have--including your Lead Survivor (the one in your color). 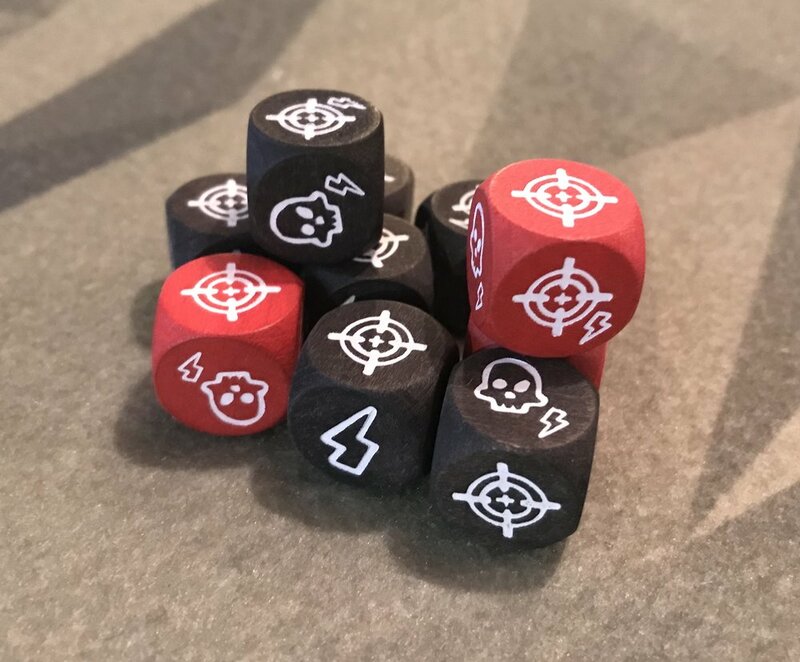 The six sides of the dice are: 1 blank, 2 targets, 1 target with a bonus, one lightning bolt, and 1 skull. Before the Fight, players can spend any number of Ammo Resource tokens to do a ranged attack. For each token spent you'll roll two dice, and any targets rolled kill one Zombie each--ignoring anything else rolled. If you don't choose to do ranged attack, or there are still Zombies left, you'll enter melee combat. Before melee combat, you may spend 2 Gas tokens to flee the fight. If you flee, you the card is discarded and you don't get any of the VPs that might be on it. If you don't flee, roll them bones! Blanks are...blanks. Targets kill a Zombie. Targets with a bonus will kill an additional Zombie if you spend an Adrenaline token. A lighting bolt is an "opportunity kill" and you can defeat a Zombie by spending an Adrenaline token. A skull means one of your Survivors dies, unless you spend an Adrenaline token. Later Adventure cards have Zombie Hordes. If you're forced to fight a Horde, you have to replace 1-3 of your dice with red Horde dice, depending on the strength of the Horde. Those dice don't have a blank side, and one side has a skull with no opportunity to save a Survivor with an Adrenaline token. If there are still Zombies, you'll have another round of fighting, but you might be rolling fewer dice now if you lost a Survivor. If you survive the fight, you get to keep the card if it has VPs on it. Of course, some cards force you to fight and there are no VPs. Zombies are evil... If all of your Survivors die, you're out of the game. Some cards give you Special tokens as rewards, and those can be useful in later trips through the Paths. Although some Special tokens actually hurt you if you have them later. It adds another layer of fun to the game. You keep playing Rounds, and when a player is eliminated, Paths become more expensive to take. There are a number of ways the game can end. If only one person has any Survivors at the end of an Encounter phase, he or she wins. If everyone is eliminated, no one wins. Except the zombies. If two or more players have Survivors left after 8 Rounds, then you add up points on facedown cards you've won. You also distribute Epilogue cards, each of which is worth 3 VPs for the player who ends with the most of each of the three Resources, and the one who has the most Survivors left. Ties mean no one gets that card. First I want to talk about the art design of Hit Z Road. It's brilliant. 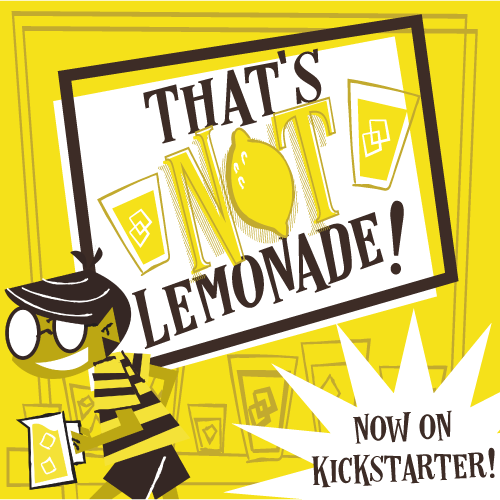 The game looks as though a kid took a cheesy old board game called Hit the Road and crossed things out and changed the game to make it match his new reality. As "Martin" tells us on the game rules, "...one day when I was bored I made this game about last year's trip. Hope you like it." The Epilogue cards are even on the back of cards of from other games--from other publishers!--including Ticket to Ride and Dixit. I love that those other publishers gave Space Cowboys permission to use their images in such a fun way. Space Cowboys was even gutsy enough to continue that theme on the back. It looks like the faded, worn back of a crappy game. There's no indication of what the game really is, or what sort of meta thing is going on here. No one picking this up on a store shelf would have any idea what's going on. Now that's commitment. The auction is much more interesting than your standard auction game, because you're not just using money, as in most auction games. You're using three different kinds of currency, all of which are worth the same when you spend them, but all of which do different things in the other parts of the game. It's so clever, and amps the decisions right up. And auction games usually don't work well with nongamers. They're not always the best at valuing things, so their bidding can throw things...off. But somehow Wallace has made an auction game that works really well with nongamers--and that's WITH having three different currencies worth different values depending on the person and situation and so many other things. I can't believe he pulled it off! The game is best with more players, and even with a full count, it still only takes 45 minutes or so. There are a few small downsides. Player Elimination--It usually happens later in the game, but it's still a bummer when someone is sitting out while the others are having fun. Zombies--This is a zombie game, so some of the artwork on the cards is a little scary/creepy/bloody. It was a fine line for me as to whether to let my 10-year-old play it. I did, but I'd understand if you didn't. Those aren't big deals to me; this game is still terrific. Firestone's Final Verdict--Hit Z Road surprised the heck out of me. It's a fun, fast, and tense game of dice-rolling and resource management. And the art design and easter eggs are some of the best I've ever seen. It's superb for gamers, nongamers, and everyone in between. Big thumbs up from me. Have you played Hit Z Road? What are your thoughts? Let us know in the comments, and thanks for reading!